The initiative of the International Classical Theater of Mérida to extend its influence, its magic and its contribution to the performing arts beyond the confines of the Roman Theater of Mérida has led, in recent years, to the performance of different shows in the following venues. Medellín. 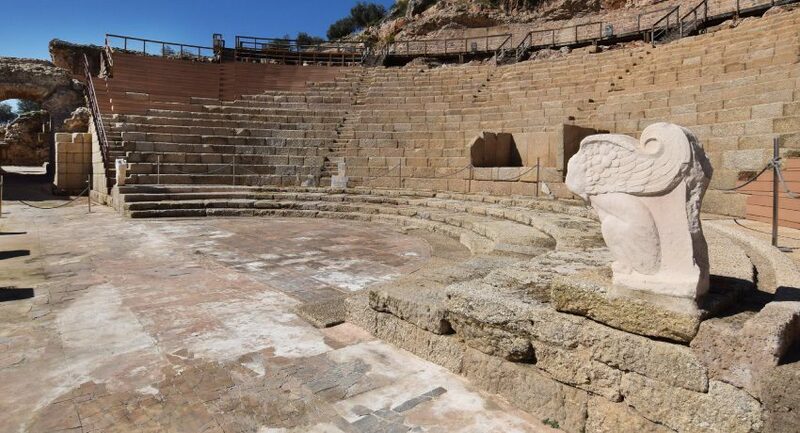 The renovated Roman Theater of Medellín (Badajoz) is hosting, this summer for the sixth year in a row, an extension of the Mérida Festival programme which returns the monument to its former function as a theatrical stage. Regina. Owing to its impeccable collaboration with the Regina Theater Festival of Casas de Reina (Badajoz), the Mérida Festival sponsors the most important show of the event organized by the City Council of Casas de Reina, which has reached its thirteenth edition this year. Cáparra. The International Classical Theater Festival of Mérida opened its fourth extension in the Roman city of Cáparra in 2017, the first stage of the event that saw the light in the province of Cáceres. Madrid. The Mérida International Classical Theatre Festival presents the fourth edition of the Mérida Festival in Madrid. In this occasion, the plays selected to participate in this extension of the festival in the capitol belong to the 64th and 63rd editions, celebrated in 2018 and 2017, respectively.